The Library’s painstaking recovery of significant and neglected classic American writers continues with this handsome edition of the three best-known works of our first novelist of sustained achievement. 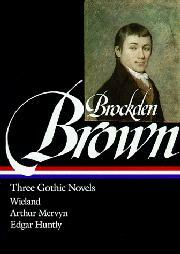 Into a brief lifetime (1771—1810) also dedicated to “epic” poetry and tireless political commentary, Brown crowded several ambitious melodramas that absorbed various European romantic influences, and foreshadowed the more accomplished “Gothic” fiction of Poe, Hawthorne, Melville, and, eventually, Faulkner. Wieland (1798), his only widely read novel, spins from the actual story of a deranged farmer who murdered his family a gripping tale of madness complicated by the notorious “science” of ventriloquism. Its successors—Arthur Mervyn (1799), which vigorously dramatizes an epidemic of “yellow fever” in Brown’s native Philadelphia, and Edgar Huntly (1799), a collection of nonstop action scenes unified by the intriguing theme of sleepwalking—are in many ways its equals. An important and long-overdue homage to one of the milestone figures of our early literary history.